All family members of a patient diagnosed with MEN syndromes should be screened for MEN. 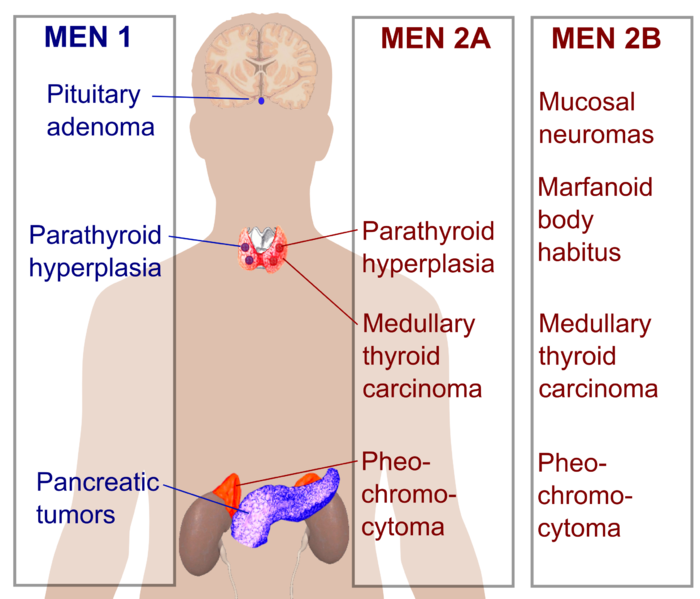 100% of patients with MEN IIA have medullary carcinoma of the thyroid. Physical findings of MEN IIB: Mucosal neuromas (mouth, eyes, etc), Marfanoid body shape, abnormal arch of foot, constipation. 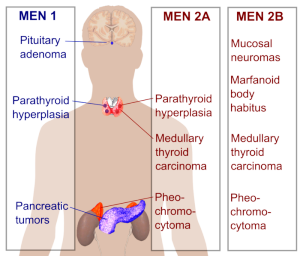 Major difference between MEN IIA and IIB: MEN IIA has Hyperparathyroidism – hyperplasia, MEN IIB does not. MEN I and MEN IIA have hyperplasia of the parathyroid – treated with removal of all parathyroid tissue with autotransplant of some parathyroid tissue – perhaps into the forearm.